I wasn’t sure what a revisit to this film would bring. 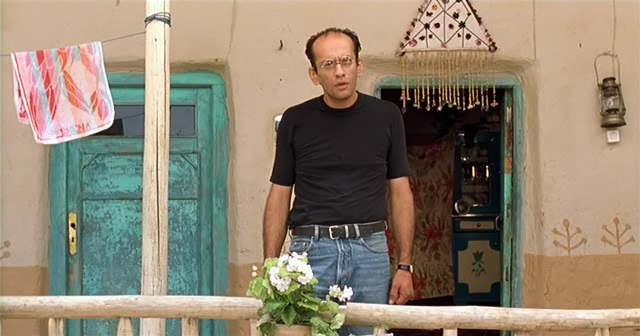 It was the movie that opened up Kiarostami to me, after unsuccessful tries with Where Is My Friend’s Home? and Taste of Cherry (both of which I very much intend to try again, especially after being so smitten with the other two in the “Koker trilogy”). But was my initial impression too exuberant? Was I overwhelmed by the excitement of finally getting what all the fuss was about? My old review was too brief to provide many clues, although certain aspects of the film did still linger in my mind… especially the repeated frantic excursions up to the cemetery for proper cell phone reception. On this second viewing, it’s clear that my enthusiasm was fully warranted. As fond as I am of Close-Up, this may well be Kiarostami’s finest work (I should note here there are several I have yet to see, including Certified Copy, his latest). Behzad and his colleagues arrive at a remote Kurdish village. Much about their visit is unclear. The villagers call him “engineer” but is that his job, or does he just politely respond to it? Does he work in telecommunications as we’re occasionally led to believe? Why are they waiting for an old woman to die? It has something to do with a death ritual, which may or may not be unique to this particular village. They may or may not intend to film it. Someone on the other end of that cell phone seems anxious for them to get it done. We never see the faces of the colleagues, or the old woman, or the man digging a ditch in the graveyard. Mysteries upon mysteries. Behzad, it seems, represents the attempted encroachment of modern society on rural life (or perhaps something to do with the Kurds specifically, my cultural ignorance may be a big stumbling block here in several ways). He tries to take a photo of the cafe keeper, but she scolds him. He tries to hit on the milk girl, and she too rebuffs him. He even tries to flip over a turtle, but after he leaves, the turtle recovers. “Am I a good man or a bad man?” he asks the boy who acts as his guide/concierge. A good man, he is told, but it’s not that simple. He hangs over the old woman’s infirmity –hidden behind that blue-trimmed window — like a vulture (“Are you an angel of God or angel of Death?”) and yet there are indications that he starts to find the process distasteful. He uses a human bone to scratch himself and keeps it on his dashboard like a trophy… but ultimately discards it. He does nothing to help the ditch digger, but he does race to get others to help. He is respectful one moment, and dubious the next. Although we sense he is slowly being seduced by the simple lifestyle of the village, he has no place there. Kiarostami refuses to pigeonhole him and watching him try to (and not try to) get along with the villagers is endlessly fascinating. Has he truly grown from this experience? Perhaps it doesn’t even matter, as long as the village is safe. This entry was posted on March 17, 2012 at 11:51 pm	and is filed under Movie Reviews. You can follow any responses to this entry through the RSS 2.0 feed. You can leave a response, or trackback from your own site.